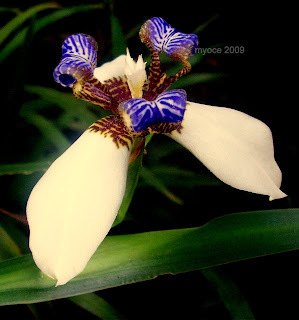 Did you know that the Iris flower is named after the Rainbow Goddess ? It is because they come in so many colors and hues. I only took pictures of two kinds here...the white-purple and the light yellow. 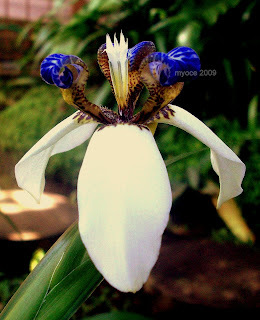 They are also called 'anggrek air' [ water orchids] here. 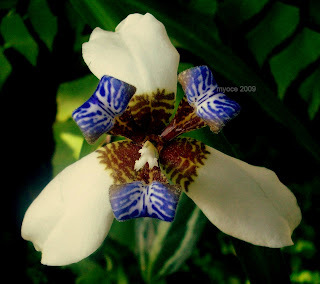 I had to darken some of the pictures here in Picasa, to bring out the beauty of the flower. The blue tints you see are actually purple...but I'm not a professional photographer, so I don't know yet how to fix that with my small automatic camera. 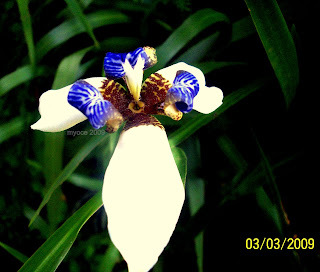 The white-blue one is my mom's, but the yellow one is at Sentul City..in one of the garden on the side of the road [ Shhhh ! !.....don't tell the security officer ! ].